PUTRAJAYA: A meeting Tuesday between the Education Ministry and a group that included six MIC-appointed representatives over the the controversial Interlok issue, proceeded smoothly, said Deputy Education Minister Dr Mohd Puad Zarkashi, who chaired the meeting. Dr Mohd Puad said ministry officials, including Director-General of Education Datuk Abdul Ghafar Mahmud, listened to the reasoning of all quarters in the 22-member group that also comprised non-governmental organisations (NGOs) and academicians. "We proceeded with the dialogue in a cordial and intellectual manner without getting emotional because the ultimate objective, as agreed upon, was to come up with suitable recommendations and a solution to the issue," he said. He said a report on the four-hour meeting would be handed over to Deputy Prime Minister and Education Minister Tan Sri Muhyiddin Yassin later Tuesday for presentation to the Cabinet. He also said that the contents of the report could not be revealed as yet because only the Cabinet could make a decision on the matter. Interlok, a novel on the integration of the Malays, Chinese and Indians in then pre-independence Malaya, written by national laureate Datuk Abdullah Hussain, had sparked controversy as it allegedly contained words deemed sensitive to the Indian community. 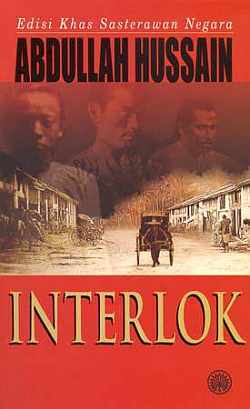 The book is being used as a required text for Malay Literature in the SPM examination, beginning this year. Dr Mohd Puad said at the outset of Tuesday's meeting, ministry officials explained how the novel had been selected as the required text for Malay Literature for Form Five students.